I. Stochastic Processes. II. The Single Server Queue. III. Some Variants of the Single Server Queue. IV. Some Recent Developments. Appendix. Notes on the Literature. References. References Supplement. Index. This classic work, now available in paperback, concentrates on the basic models of queueing theory. It has a dual aim: to describe relevant mathematical techniques and to analyse the single server queue and its most important variants. This book concentrates on the most basic model of queueing theory, i.e. the single server model. It presents a complete and clear description of mathematical techniques ofr the investigation of queueing models. 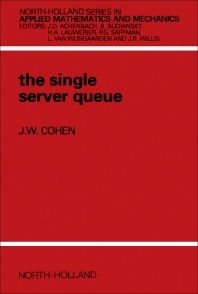 It also contains an extensive analysis of the single server queue and its most important variants.